Since the 19th century, which saw the birth of psychology as an independent scientific discipline, the study of human development has attracted the attention of scholars. Important developmentalists like Sigmund Freud, Jean Piaget and Lev Vygotsky laid the foundations of several theories that have become dominant in this domain and that have contributed much to our understanding of how children develop into adults. Since these early days of the pioneers of development studies much research has been done on the motor, cognitive, social and emotional development of children. This offers the interested music teachers a wealth of knowledge and insights that can help them to understand their profession from a theoretical perspective and thus can strengthen and enrich their own skills as a music teacher. Childhood is commonly divided into five periods (here I follow the definitions used by Lightfoot, Cole & Cole (2013), ‘The Development of Children’). Prenatal period: from the 9th week (fetal period) the child is subject to environmental influences originating from outside. Infancy (0-3 years): rapid physical growth, beginning of motor and cognitive development, including attention and memory; language acquisition. Early childhood (3-6 years): impressive gains in both gross and fine motor skills, development of information-processing approaches, of identity and self-regulation. Middle childhood (7-11/12 years): improved strength, agility and balance; more complex mental operations, logically combining, separating and transforming information; a new sense of self through social comparison. Adolescence (12-18 years): rapid growth; increased decision-making skills and scientific reasoning; increased ability to regulate emotions; development of a more stable sense of identity. Below I will cover in particular the development of children in middle childhood, since this was the scope of my research. Middle childhood can be seen as a transition into a new phase, the beginning of the ‘age of reason’ (White, 1996). Children start to become independent human beings and start to explore the world on their own. Generally, they are ready for school and able to learn to read, write and count by the age of about 6 years. Throughout the world parents tend to have new expectations of their children as they approach the age of 6 years. At this age children begin to be treated differently by both their parents and their environments, being expected to show the ability to acquire certain skills, to behave according to social norms and to demonstrate compassion for others. In this chapter I will treat the motor development (2.2), cognitive development (2.3) and social development (2.4) during middle childhood from a theoretical perspective, focusing on those issues I find most relevant for understanding the profession of music teaching. In addition, I dedicate special paragraphs to the intriguing question of talent (2.5), the important issue of deliberate practice (2.6) and – last but not least – the primary role of motivation (2.7). In early childhood children have an enormous motor drive. They never tire of jumping, dancing and repeatedly making the same movements and playing the same games. This motor development increases during middle childhood. Children become stronger and more agile, and their balance continues to improve. Their continuous physical activity is essential for the development of their motor skills, whether it concerns writing, gymnastics, ball games, riding a bike or playing the violin. These skills are a form of experience-dependent learning: the child is ready to learn these skills, but depends on the environment to get offered the chance to develop them. And it takes a lot of practice to master such complex skills. In recent years it has become clear that in brain development next to the growth of ‘gray matter’ (for information transmission and storage) the growth of myelin (‘white matter’) is equally important. Myelin is insulating material that grows around the neural axons and enables to transmit signals from 10 to 100 times faster than unmyelinated axons (Lenroot et al. 2009). Thus, in physical terms the repetitive practice of skills entails the development of myelin in the brains that strengthens the neural circuits and thus speeds the transmission of nerve impulses. This explains why practice is so important for the acquisition of skills. Boys and girls differ in the development of their physical skills. Generally, boys tend to be slightly more advanced in motor abilities that require force and power while girls tend to be more advanced where it concerns fine motor skills and balance (Cameron, 2002). This explains why girls tend to work more effectively and often move and dance somewhat better to music while boys have the tendency to be more careless. Nevertheless, both boys and girls enjoy the physical exercise of routine practice, and this is very helpful in developing technical skills. In middle childhood children are very receptive to the development of complex motor skills and this offers great chances for laying the foundation of their technical skills at a later age. In middle childhood, the brain is still growing, although not in the same tempo as seen in infancy and early childhood. Particularly in the early years of middle childhood, between the ages of 6 and 8, growth and further development of specific parts of the brain that are important for changes in cognitive skills take place. At this age, the frontal and prefrontal cortices are developing further and the connections between the frontal lobes and the rest of the brain become stronger. Another important aspect of brain development during middle childhood is the synchronization of electrical activity in different areas of the brain (called EEG coherence) (Lightfoot et al. 2013, ‘The Development of Children’ p. 398). Different parts of the brain function more effectively as co-ordinated systems. It goes without saying that a strengthened co-ordination of the different brain functions is indispensable for young violinists who have to learn to co-ordinate movements (motor skills), listening and reading (sensory perception) and understanding of what they are doing (cognitive skills). In addition to the normal, biological growth and maturation of the brain, the environment also affects the development of certain brain structures. Developmentalists distinguish two major classes of brain development: ‘experience-expectant’ and ‘experience-dependent’ learning (Lighfoot p. 128). In experience-expectant learning the brain is ‘pre-wired’ for certain experiences that are expected such as seeing patterns or borders between light and dark, hearing sound and using language. In normal circumstances the brain of every infant will develop this. However when children are born blind or deaf or if they are severely deprived of human contact in the critical period of development, the brain will fail to develop normally. The developing brain is also open to experience-dependent learning: a child takes advantage of specific information from the environment, and can easily acquire certain skills and knowledge which can be much more difficult to acquire at a higher age. In this case there is not a critical period, within which the skills should be acquired. However, middle childhood can be defined as a sensitive period. The growth spurt of the brain at the beginning of middle childhood and therefore the sensitivity of the brain for experience-dependent learning gives a huge opportunity to make use of the plasticity of the brain. According to Jean Piaget, middle childhood is a period of ‘concrete operational development’. This is a period in which egocentrism declines and children learn to listen to others and to work together. The emergence of mental operations allows sorting, classification and experimentation with variables. They learn to analyse and they become capable of solvingproblems, with the proviso that these problems must be concrete. At this age, children have not yet acquired the capacity of abstract reasoning. In this period also metacognition develops. There is an increase in the abilities of attention and focus; the child’s capacity for self-regulation and planning of activities starts to develop. They get a more objective sense of their identity, their emotions, their capacities and goals. Their memory increases in speed and capacity, they gain more knowledge and are therefore more capable of trying out new and effective strategies. Research has shown that children can be taught memory strategies, the “deliberate use of actions to enhance remembering” (Lightfoot 2013, p. 411). Translated to the practice of violin teaching, this means that children in this age group can be taught to practice independently, provided that the given tasks are clear and concrete. It is essential that a homework assignment is completely understood and already attempted during the lesson. The task should be a challenge for a child to improve by practicing, but not so difficult to present a risk of failure. Repetition is absolutely essential. This does not mean that a study or a piece of music should be repeated endlessly, but that the same issue should return in various pieces and exercises until the child is fully capable of recognizing, practicing and internalising this issue. In the context of music teaching it is interesting that Trainor (2005) distinguishes two major aspects of perception and cognition of music: temporal (or rhythmic) structure and spectral (or pitch) structure. In the development of pitch structure, she sketches a sequence of three phases: (1) the distinction between consonance and dissonance; research has shown that infants have a preference for consonance as young as 2 months of age; (2) scale structure; this dimension is dependent of the type of scale used in the child’s culture; by the age of 5 years children begin to recognize which notes do not fit in the tonality they are used to; and finally (3) harmony; a complex harmonic syntax is special to Western music; research shows that children learn to recognise out-of-harmony notes by the age of 7. It is important to be aware how much children have to learn what seems to be ‘natural’ to adults. The general picture from this research is that children perform best at rehearsed music and that after several years of teaching and practising this has improved most, suggesting that this might show a bias with teachers (and Western musical culture in general) for reproducing repertoire from notation (Mc Pherson 2005, p. 30). He rightfully underlines that it is important for young musicians to develop all these dimensions of music making and to learn to “think in sound”. 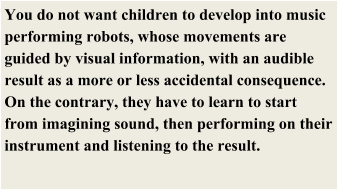 They should be “exposed to a range of visual, aural and creative performance skills to help extend and challenge them in different ways, so that they learn how to co-ordinate their ears, eyes and hands (...): proceed from sound to symbol, not from symbol to sound” (p. 6-7). In middle childhood children spend relatively less time with their parents and more with their age-mates in school and elsewhere. Gradually peers assume a more prominent place in their lives and exert more influence on their behaviour and development (Lightfoot 2013, p. 465). Children become more interested in each other and the first real friendships arise. They start to compare themselves with others and quickly discover that they have more or less potential in certain areas than other children. They develop a sense of themselves in relationship to others (‘social comparison’). Lightfoot (p. 466) quotes E. Erikson’s theory that the main challenge of middle childhood is to establish a sense of competence. In Erikson’s words the challenge is that of “industry versus inferiority. Children who emerge from middle childhood with a sense of industry believe that they are competent and effective at activities valued by adults and peers. Those who emerge with a sense of inferiority feel inadequate, believing themselves incapable of mastering the tasks expected of them”. Children learn to see themselves in terms of both their ‘actual self’ and their ‘ideal self’, the kind of person they would like to be. The difference between these two can be a source of motivation, as long as they do not consider the discrepancy too large to overcome. The confrontation with their peers challenges children to choose between competitive and co-operational behaviour. Initially they tend to say explicitly that they can do something faster or better than other children. This can easily turn into a worrisome competition, the more so because parents also tend to compare their children to other children, be it at school, in sports or music education, and in this way quietly participate in the silent battle. In order to prevent this kind of negative competition it is essential to make use of this natural tendency for comparison in a positive way. Music teaching in group lessons as soon as possible is an effective way of achieving this. Eachchild has his/her own work rate and his/her own strengths and weaknesses. Developing a sense of self-worth and self-confidence on the basis of ones strengths and achievement on certain tasks is important. However, the ability to show appreciation for the accomplishments of other students is equally if not more important. It is important to teach children to give positive feedback and constructive criticism to each other. Learning to appreciate the abilities of others and at the same time helping someone to improve his/her playing by giving suggestions of how to accomplish this may very well help the students to listen more critically to their own playing. A very relevant contribution to the understanding of the importance of the social group for the development of children has been offered by Lev Vygotsky’s sociocultural theory. He introduced the concept of the ‘zone of proximal development’: “the gap between what children can accomplish independently and what they can accomplish when they are interacting with others who are more competent. The term ‘proximal’ (nearby) indicates that the assistance provided goes just slightly beyond the child’s current competence, complementing and building on the child’s existing abilities” (Lightfoot 2013, p. 22). In her article ‘Training the Talented’ (2016) Burland describes how helpful the group can be for a young music student. It offers the student the companionship of some one of his/her own ability. The progress of one stimulates the progress of the other. Moreover, the younger child can identify with role models close in age and expertise, ‘idols within touching distance’, “simply because they are aware that they are not alone in the amount of work they have to dedicate in the pursuit of excellence” (p. 122). During middle childhood, the influence of friends and peers increases steadily, until adolescence, when the peer group often has become the main point of reference for the teenager. Belonging to the peer group can become the most important focus of the child or adolescents. Nothing is more demotivating than being excluded from the group because a child is the only one who plays the violin. On the other hand the encouragement of supportive friends can motivate every child to keep playing an instrument with pleasure. It is therefore essential for young violinists to play together with other children, whether this takes place in a youth orchestra, a small ensemble or in a group lesson. Children tend to seek friends among like-minded children. Friendships become increasingly important in middle childhood. They contribute to a proper self-confidence and a desired social behaviour. The name of the ‘School voor Jong Talent’ suggests that there is such a thing as talent. But what does it mean, having talent? For the common layman someone with talent has obviously more capabilities than others, and usually these capabilities are presumed to be innate, genetically inherited. However, in the course of the 20th century, there has been a lot of research on the issue of talent and development psychologists have developed new views and new theories in this so-called nature-nurture debate. One of the leading scholars in this field is Ericsson, who in a famous article ‘The Role of Deliberate Practice in the Acquisition of Expert Performance’ (Ericsson et al. 1993) stated that “expert performance is the result of an extended process of skill acquisition mediated by large, but not excessive daily amounts of deliberate practice” (p. 387). His claim, often quoted by others, is that irrespective of the domain (sports, music etc.) a period of 10 years (with accumulated deliberate practice of about 10,000 hours) is needed for the acquisition of the skills needed for expert performance. This seems to suggest that, given enough time for deliberate practice, any one could learn to be an expert in any field. Indeed, Ericsson writes: “We reject any important role for innate ability”. But he continues: “It is quite plausible, however, that heritable individual differences might influence processes related to motivation and the original enjoyment of the activities in the domain and, even more important, affect the inevitable differences in the capacity to engage in hard work (deliberate practice)” (p. 399). Some scholars took this argument even further. Howe concludes in his article ‘Innate Talents: Reality or Myth?’ (Howe et al. 1998, p. 147): “The evidence we have surveyed in this target article does not support the talent account, according to which excelling is a consequence of possessing innate gifts. This conclusion has practical implications, because categorising some children as innately talented is discriminatory. The evidence suggests that such categorisation is unfair and wasteful, preventing young children from pursuing a goal because of the unjustified conviction of teachers or parents that certain children would not benefit from the superior opportunities given to those who are deemed to be talented”. Lehmann refers in his article ”Persons in the Shadow” Brough to Light: Parents, Teachers and Mentors: How Guidance Works in the Acquisition of Musical Skills’ (Lehmann 2014, p. 65) to an earlier study (Lehmann et al. 2002) of Wolfgang Amadeus Mozart and 21 contemporary composers, and seems to suggest that his reputation as a child prodigy can be explained exclusively on the basis of his early started rigorous training by his professional father. Other scholars, however, have expressed opposite views. Hambrick quotes in his article ‘Deliberate practice: Is this all it takes to become an expert?’ (Hambrick et al. 2014) several scholars that heavily criticized Ericsson’s views and he concludes “that deliberate practice is necessary but not sufficient to account for individual differences in performance” (p. 36). According to Hambrick’s research deliberate practice could account for only 29.9% of variance in music performance (ibid. p. 40). Sloboda intends to prove in his article ‘The role of practice in the development of performing musicians’ (Sloboda et al. 1996) that in the comparison of different groups of young musicians, performing at different levels, the higher level of one group can be explained by the fact that they have accumulated the required hours of practice at a faster rate – and thus at a younger age – than the other groups (p. 300). The fact that within the compared groups there were individuals who did less than 20% of the mean amount of practice for a certain grade and others who did over four times as much practice compared to average, is regarded by Sloboda as not relevant for his conclusions (p. 301). In my view this might raise doubts about the validity of his conclusions. Trainor concludes in her above-mentioned article (Trainor 2005, p. 274) that “not all students who practice a lot become masters, so there also may be a contribution of innate talent”. However, she adds, “it is also somewhat difficult to predict musical genius from early childhood promise”. As a final quote from the vast literature in this field, I refer to McPherson (2005, p. 27), who states to have found “ample evidence that better players possessed more sophisticated strategies for playing their instrument very early in their development and that these players were the ones who went on to achieve at the highest level”. As you may have concluded, the nature-nurture debate in the domain of talents and the acquisition of expert skills, is very dynamic and shows rather opposite views, some of which even tend to be ideologically motivated (cf. Howe quoted above). What does all this mean for me in my practice as a violin teacher working with ‘young talents’? My work can be seen on the ‘nurture side’. However, when I start with young children, they have already experienced years of influence from their environment – how much music making and listening was there in their families? - and are no longer ‘tabula rasa’. So the question whether these children have talents that are innate, is not of primary importance. More important is, what the capacities (‘talents’) of these children are when they start their violin lessons with me and how these develop in the course of their education process. Here I adhere to the view that there is no such thing as a one-dimensional talent for playing the violin. I refer to Gardner’s theory of “multiple intelligences, each of which coincides with a different cognitive module and follows its own developmental path” (quote from Lightfoot et al. 2013, p. 421). And within these domains, you can distinguish many different aspects (appreciation of tone quality, good hearing of intonation, pitch memory, phrasing, etc. etc. ), all of which may be easier for one child to master than for an other child at a certain moment in their development, but which may also change and develop over time. Each child has his/her own balance of strengths and weaknesses. It is the teacher’s challenge to get the most out ofeach student. For this reason it is essential that each student is guided individually. It is essentially incorrect to approach all students in the same way. On the contrary, it is important, that all skills required to become a good musician are developed in each student individually. Using one single method for all students is therefore undesirable as too many specific issues may get underexposed for a certain number of students. The truth is that children who pass their entrance exam for the SvJT show better skills and have a higher motivation than their peers. However, at this young age it is very difficult to decide who is really ‘talented’ enough to develop into a professional violinist. The main criteria applied at the entrance exam have to do with attitude, motivation and learning skills. And in those cases that I had to decide to stop teaching one of my students, this was for the same reasons: lack of discipline (attitude) or lack of learning skills. In my work, I feel inspired by Coyle (2009), who describes his search for the secret code of ‘talent hotbeds’ in the world. He describes this code in three elements: ignition; deep practice; and master coaching. In short you might say: the secret code lies in the combination of strong motivation, focused practice and good guidance. My point of departure is that everybody has certain musical skills, since we all have language skills, which includes a sense of phrasing, rhythm and intonation. For me it is the challenge to enable all my students to develop their skills, departing from the skills they already have and building upon that, step by step, each child in his/her own way, at his/her own speed and if necessary in his/her own order. I have experienced the malleability of talent in my class for some decades now. For me as a teacher it is very rewarding to see how far you can get with such an approach. These ideas of talent will be my starting point in this research. It makes the question even more interesting why some children show motivation, interest and perseverance and obtain the title of ‘talented people’ while others do not. In his above-mentioned article Ericsson describes expert performance in terms of “acquired characteristics resulting from extended deliberate practice” (Ericsson 1993, p. 363). Ericsson coined the term ‘deliberate practice’, which in his view is the major distinctive factor between professionals and amateurs. Also those who do not believe that an accumulation of 10 years of deliberate practice gives in itself a guarantee for a successful career as an expert, e.g. as a concert violinist, will agree that a sufficient amount of deliberate practice is indispensable if you have the ambition to be a performing musician. Unlike the acquisition of language, which is a form of experience-expectant learning, a child is not pre-wired for training to play the violin; this is a form of experience-dependent learning. Young children will not learn to play by practising alone, unless they are guided in this process and are taught the metacognitive skills for analysing what they are doing. They have to learn how the movements they make with their arms and fingers relate to the sound they make on their instrument, and how this is translated into the visual information of the music notation. You do not want them to develop into music performing robots, whose movements are guided by visual information, with an audible result as a more or less accidental consequence. On the contrary, they have to learn to start from imagining sound, then performing on their instrument and listening to the result. Then they must learn to judge their own results, identify shortcomings or technical problems and try to overcome them. All this is easier said than done. Young children take years to assimilate strategies for deliberate practice. Deliberate practice is about trying to exceed one’s previous limits (Lehmann 2014, p. 58). Through concentrated efforts you try to move just beyond your current abilities. Coyle – who uses the term ‘deep practice’ – speaks of a paradox: “struggling in certain targeted ways – operating at the edges of your ability, where you make mistakes – makes you smarter” (Coyle 2009, p. 18). Children can be taught to use strategies for their practice: slowing down the speed, isolating difficult spots, looking at the notes before they start playing and imagining the sound before they play, etc. Most important, however, is developing an attitude for deliberate practice. They must learn to listen to what they are doing, feel what they are doing, think about what they are doing. This is stimulated when they see and recognise the reward for their efforts. It is the task of the teacher to help the student forward one step at a time, by identifying the right moment for the next step to be made. 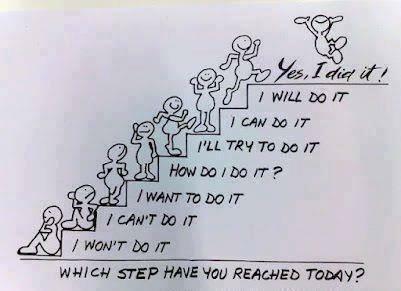 Every child understands the image of the staircase: you can’t jump upwards in one leap, but doing it step by step gives self-confidence. Coyle (2009, p. 79ff) mentions the example of the Meadowmount School of Music (NY), founded by the famous violin teacher Galamian, for a strategy he calls chunking: divide a task into its smallest possible parts (chunks), practise these in different speeds, rhythms, etc. and build it up from there. This school, renowned for violinists such as Joshua Bell and Itzhak Perlman, takes the idea of chunking to the extreme, and its track record speaks for itself. Deliberate practice is demanding. It takes effort to concentrate on your work and the child must learn that the quality of practice is more important than the quantity. In the beginning practising for about 20 minutes with full concentration is sufficient. In the course of the years they will gradually lengthen their practising time, as the tasks become more complex. According to Ericsson (1993, p. 368) “deliberate practice requires effort and is not inherently enjoyable”. This notion is regularly quoted with approval by other scholars. However, I believe this to be incorrect. In my experience, children can really enjoy deliberate practice, working on scales, technical studies etc., once they really understand what they are doing and experience the results for themselves. As long as they feel fit to take the challenge of the task: one step at a time, so that they know on what they have to concentrate in the specific task they are performing. Ericsson makes a clear distinction between deliberate practice, “a highly structured activity”, and more informal musical activities, such as playing well-known pieces for fun or fooling around on the instrument. According to him “this state of diffused attention is almost antithetical to focused attention required by deliberate practice to maximize feedback and information about corrective action”. However. Lehmann (2014, p. 63) describes that “those who practised most were also engaged more in informal playing activities (self-guided activities unrelated to teacher-set goals)”. In my view, informal playing is a very welcome form of practice, in addition to deliberate practice, because it strengthens the child’s motivation, but, moreover, is an effective way of making the child feel really free and at ease on the instrument. And isn’t that what ‘playing an instrument’ is about? There is broad consensus that motivation is one of the primary factors contributing to the success of musical education. Given the long way it takes to become a professional musician, it is almost unthinkable that a child would succeed without the will to learn to play, the belief that he/she is capable of learning so, and without the capability to enjoy the many things on the long way of musical training. Coyle (2009, p. 97) speaks in terms of “motivational fuel” that is required for the growing of skills through deep practice: energy, passion and commitment. In his view motivation is created and sustained through a process he calls “ignition”. He describes inspiring examples of how young people in ‘talent hotbeds’ (in the field of sports or music) experienced their moment of ignition, and have been able to maintain that in their groups. It often starts with an exceptional performance they witness, which then inspires thoughts like “I can do this too!” of “This is who I want to be!” Once started their training, it is important that the conditions of their training keep the fire burning; but it starts with the ignition. You can distinguish between extrinsic and intrinsic motivation. McPherson and Renwick describe a research based on interviews with young children before they started taking music lessons and an evaluation 9 months later (McPherson et al. 2016, p. 172). They noted that “children who made the least progress tended to express more extrinsic reasons for learning, such as being part of the school band because their friends were also involved. In contrast, children who made rapid progress were more likely to express intrinsic reasons, such as always having liked music or wanting to play particular pieces for their own personal enjoyment”. Nevertheless, there is nothing wrong with extrinsic motivation in itself. Most children starting music lessons will be inspired by an example: their parents, elder brothers or sisters, or one of their friends or age-mates. It may be difficult to judge if this is a case of intrinsic or extrinsic motivation: the fascination with music or with an instrument, or the wish to belong to the group of people making music. Perhaps, it does not make so much difference, because in both cases the child gets the chance to become acquainted with music and with playing an instrument. Probably, in the long run intrinsic motivation is more sustainable than extrinsic motivation. So it is important that the child is stimulated to develop a personal interest in music and in playing an instrument. A strong signal of intrinsic motivation is when children see music as a part of their identity. Burland states that “music as a major determinant of self-concept is vital” in the training process of a professional musician (Burland et al. 2016, p. 133). 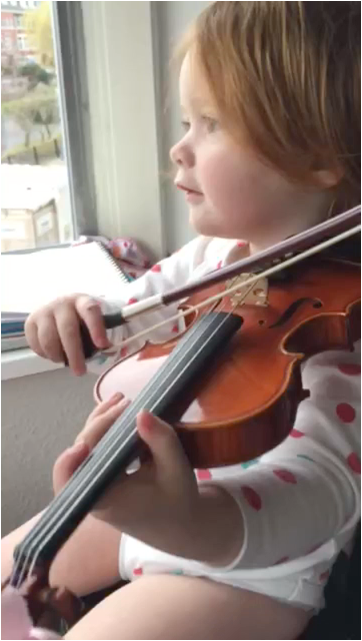 Left: 2 years old Dette playing the violin after the example of her elder sisters, ‘reading’ from music and regularly turning the pages (video). Lehmann (2014, p. 64) speaks of ‘volition’: “the cognitive process by which a person makes a conscious decision and subsequently follows a corresponding course of action”. This is not that easy for young children. Even though they may be seriously motivated and may enjoy their practice, most children have to overcome motivational problems before they start practising. Here is a role for the parents to play: to build a daily routine, preferably a fixed time and a quiet place for the child for his/her daily practice, making the threshold for starting as low as possible. It goes without saying that a supportive environment - teachers, family, friends - is very important for the child’s motivation. Lehmann (2014, p. 63) states that “the friendliness of the first teacher” is an indicator of the chance that the child will continue with violin lessons. A warm teacher helps the child to appreciate music making and believe in his/her own abilities. Moore stresses in his article ‘The social context of musical success: A developmental account’ (2003, p. 531) how important it is to have fun in the early stages of learning: “the teachers of more able children were remembered both as being enthusiastic and also as generous; rewarding any small interest or involvement”. The role of the parents is crucial for the child’s successful development, but also for maintaining motivation. Parents need to be motivated themselves as well. Ericsson (1993, p. 370) speaks of “extraordinary commitments by parents [which] are probably based on the belief that their children are somehow special and particularly likely to succeed”. Clearly, there is also the risk of parents having unrealistically high expectations, which may put a heavy burden on the child. Therefore, it is desirable that the young student develops a personal view of the own ambitions and abilities, and thus an autonomous intrinsic motivation. Coyle (2009, p. 106) describes the high motivation of the young people he observed as “a slightly irrational state. One forgoes comfort now in order to work toward some bigger prospective benefit later on”. I would add that for keeping up the child’s motivation it is important to show them that there are not only these far-away benefits, but also results within reach today. The teacher can help the student to recognize the steps forward he/she makes, how small they may be, by making compliments related to these steps. In Coyle’s words: “At all the places I visited [i.e. talent hotbeds], praise was not constant, but was given only when it was earned” (Coyle 2009, p. 137). Lightfoot (2013, p. 447) distinguishes two different forms of motivation: a mastery orientation and a performance orientation. Some children adopt a mastery orientation in which they are motivated to learn, to try and to improve. Other children have a performance orientation in which they are motivated by their own level of performance, their capability and incentives for trying. Children adopting a mastery orientation appear to be more successful in the long term. If they do not immediately or quickly succeed they remain optimistic and try harder or try to reach their goal in a different way. They are convinced that each goal can be reached by effort. They are not afraid of problems but they try to find solutions. On the contrary children with a performance orientation have the tendency to believe that they are not capable if they do not succeed immediately. They often give up in an earlier phase and tend to avoid difficult tasks in the future. Related to this is the distinction that can be made between different models of intelligence: “Some children adopt an entity model of intelligence; that is, they see intelligence as quantitatively fixed in each individual. Other children, by contrast, adopt an incremental model of intelligence; they see intelligence as something that can grow as one learns and has new experiences “ (Lightfoot 2013, p. 448). One can imagine that children having an incremental view of their own abilities, are much more easily motivated (see also Hallam et al. ‘Changes in motivation as expertise develops: Relationships with musical aspirations’ 2016, p. 3). As a result of social comparison, children start to develop an image of how they want to be themselves, how they want to be seen by others and how they want to perform on the violin. Children understand increasingly better that their performances do not yet match their desires and goals. As a consequence the self-confidence of children declines until a nadir is reached at the age of 11 or 12 years. Often children give up at or around this age. It is a challenge to nurture pupils’ motivation from this age and through adolescence. These two attitudes of a mastery versus a performance orientation as described above are not directly related to intelligence or perceived talent. This may explainwhy some very bright students quit and achieve very little while seemingly less gifted students can sometimes achieve an unexpectedly high level of mastery. Therefore it is a challenge for teachers, parents and the environment to foster a mastery orientation already during middle childhood. Essential hereto is to train children to attribute failure to a lack of effort instead of a lack of ability.